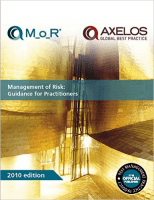 This is the 2010 3rd edition of Management of Risk: Guidance for Practitioners. Every organisation must find the right balance between opportunities and threats in managing its risks. M_o_R takes a best practice approach, which offers a structured and effective framework for risk management. Its aim is to help organisations to achieve their objectives by first identifying the risks and then choosing the right response to the threats and opportunities that are created by uncertainty. This publication is invaluable across all organisational activities from strategic, programme, project or operational perspectives. Providing a route map for risk management, M_o_R brings together key principles, a recommended approach, a set of inter-related processes and pointers to more detailed sources of advice on risk management techniques and specialisms. It also shows how the guidance should be embedded, reviewed and applied differently depending on the nature of the objectives at risk. Find out more about Accredited M_o_R® training.